The political think tank the Fabian Society last week published an interesting new report calling for a fairer immigration system. Open and Ethical is a 125-page collection of essays from various contributors and you can download it here. 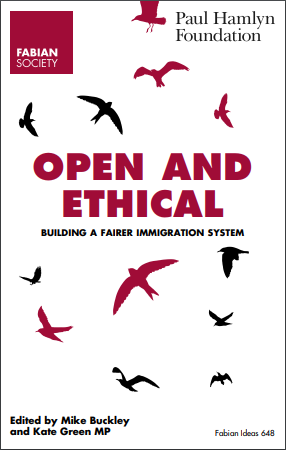 The Fabian Society says that its report sees political voices from across the spectrum join policymakers and charities in calling for the UK's broken immigration system to be fixed and for public confidence to be rebuilt. The think tank says the current immigration system is failing migrants, asylum seekers and the wider public and it is in need of urgent reform. The Right Reverend Paul Butler, bishop of Durham, said in the report's foreword: "I welcome this essay collection as another contribution to that common work of articulating a better story about migration." Among the authors of the essays are Hannah Cooper of Refugee Action and Ian Robinson of Fragomen solicitors. They join Labour MPs David Lammy and Kate Green, the SNP's Stuart McDonald, and the Conservative peer Baroness Stroud. In her essay, Hannah Cooper calls for a fairer asylum system and says the current system needs a fundamental overhaul to ensure that those seeking protection are treated with fairness, dignity and compassion. "By addressing the four elements outlined in this article – good decision-making, support, compassion and rebuilding lives – the government would be better able to deliver an asylum system that is not only fair for the people going through it, but one that is trusted by the population as a whole," Cooper concludes. The essay also highlights problems accessing legal advice: "In addition to problems with the quality of decision-making, there are significant barriers to accessing the high-quality legal advice that people desperately need to effectively navigate the system. Despite the fact that recent restrictions on legal aid have not been applied to asylum – the 2012 Legal Aid Sentencing and Punishment of Offenders Act took all immigration-related work out of the scope of legal aid with the exception of asylum – research published by Refugee Action suggests that the decline in providers across the country has had knock-on effects for asylum claimants. Restrictions on legal aid funding, moreover, mean that solicitors often do not have the time they need to spend on a person's case. This may mean that vulnerable and often traumatised people do not have the time they need to feel comfortable disclosing what are often distressing, highly personal, and sometimes humiliating experiences to a stranger." David Lammy's essay covers the fallout from the Windrush scandal and he proposes regularising the status of undocumented migrants, saying: "The Windrush scandal was a stark demonstration of the failure of government immigration policy. An amnesty for undocumented migrants, an end to the indefinite detention of asylum seekers and the guarantee of the right to appeal immigration decisions from within the UK are among the reforms which would give us a more just immigration system that works not just for migrants but for society as a whole." Lammy says undocumented migrants are one of the "most dehumanised groups in Britain" and the "hostile environment" policies of the Government were cruelly created to "make life so unliveable for those illegally in the UK that they are forced to leave." "The policy's mantra was to 'deport first, appeal later', based on the assumption that a suspect is guilty before proven innocent," David Lammy writes. Lammy adds: "The resulting legislation, carried out over two immigration acts, was not only responsible for a shocking disregard for the rights of migrants and ethnic minority British citizens, but it was also ultimately useless at reducing illegal immigration. The number of removals and detentions of undocumented migrants in the UK has fallen in recent years. In the last 18 months, the number of voluntary deportations in Britain has decreased despite hostile environment being in full force. The policy has been littered with catastrophic failures that have, according to the Joint Committee on Human Rights resulted in human rights violations and the deportation of no fewer than 63 British citizens. It has proven to be ineffectual, inefficient and inhumane." Ryan Shorthouse of the Bright Blue think tank dedicates his essay to the immigration system and the Conservative's net migration target, which he says seriously distorted and damaged both public discourse and public policy. "The government's immigration policy has been at times callous and counterproductive. For the system to operate effectively and win back public support, it must be rebuilt on three fundamental tenets: control, contribution and cohesion," Shorthouse says. Fragomen's Ian Robinson looks at how the immigration can best serve businesses after Brexit, saying: "Employers need to be able to access the skills and labour they need for their businesses to survive and grow. A post-Brexit system must offer them a certain, speedy and affordable system, while at the same time ensuring public confidence. There are lessons to be learned from elsewhere in the world which could make such a system a reality." Other essays are contributed by Sarah Lyall of the International Centre for Policy Advocacy, Jill Rutter of British Future, Peter Starkings of Global Future, and by Marvin Rees, the Labour mayor of Bristol, and Matthew Ryder, a former London deputy mayor.